National Say Something Nice Day, an “unofficial” national holiday, originated in Charleston, S.C. Based on the book, “Say Something Nice: Be a Lifter at Work”, the Mayors of Charleston and North Charleston along with the South Baptist Convention and the Charleston-Atlantic Presbytery joined together to establish National Say Something Nice Day. The purpose of this holiday is to counteract bullying and the lack of civility and common courtesy that is growing among people in today’s world. 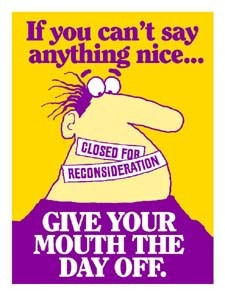 Hopefully the practice of “saying something nice today” will continue onto all tomorrows.